Bio: Christine Swann studied fine art in college, then worked as a freelance graphic designer and illustrator as well as painting murals and teaching. Recently coming back to fine art portraiture, her sensitive paintings of children have allowed her to concentrate full-time on commissioned portraits. 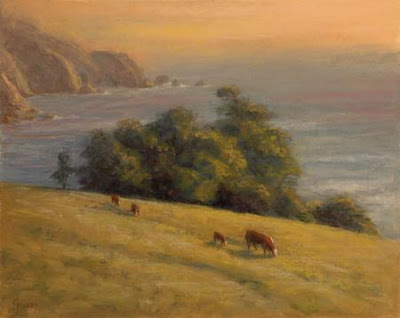 Christine is a Signature Member of the Pastel Society of America, and a member of the IAPS Masters’ Circle. 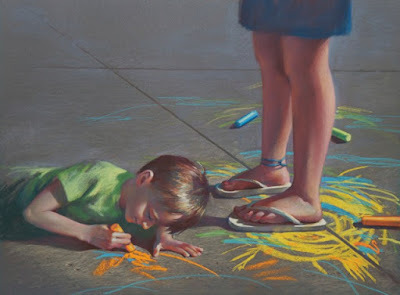 She is also a member of the Associated Artists of Pittsburgh, the Pittsburgh Society of Illustrators and was nominated as Emerging Artist of the Year in 2004. She is currently the President of the Pittsburgh Pastel Artists League and a Past President of the Pittsburgh Watercolor Society. She is an award-winning artist on the international level, including winning the 2015 “Prix de Pastel” Best of show award and the 2013 Gold Medal at IAPS (International Association of Pastel Societies) Convention. She also won the Founders Award in 2013 in honor of Flora B Giffuni at the Pastel Society of America’s International Exhibit in New York. She was featured for four years in a row in the Pastel 100, including second place for portraiture in 2014. In the January 2005 issue of International Artist Magazine, she was published as a top ten finalist in their international People and Figures competition. She was also published in the book, How Did They Do That? - 100 Ways To Paint People and Figures. She was also published in the sixth and eighth editions of Strokes of Genius. Christine is represented by the James Gallery, Pittsburgh, PA. 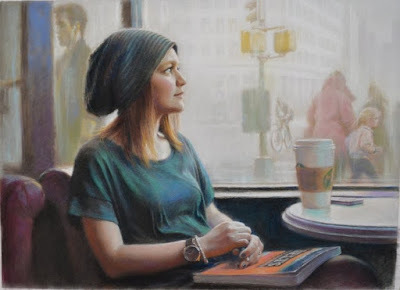 The artist states that the figure has always been her first choice as subject matter because the genre is challenging, complex, and difficult to execute well. The long stretch of time it takes to complete a portrait to her satisfaction is never dull. “I will spend hours creating a little kid’s nose but get bored quickly with painting a tree,” she says. “With a tree, I will just say, ‘Oh, that’s close enough.’”…. Navigation: Links remain on top of page. Image View: Images open on a viewer with thumbnails running along the side; the viewer is scrollable. Information on the paintings is available, especially their award status; but dimension is not always mentioned. Download is possible. Art Critic is 20 x 28 ins. Bio: Wyoming artist Gary Huber was raised in Pennsylvania Dutch farm country. His artistic development began at the early age of five when, armed with his own oil painting kit, he accompanied his mother on Plein Air expeditions into the Pennsylvania countryside. After college, he spent 25 years in Denver, Colorado, eventually founding a software company devoted to computerized landscape visualization. Made uncomfortable by the rapidly expanding Denver suburbia, Gary moved north to Wyoming where the wild and varied landscape provided him with space and inspiration. He also derived inspiration from the rich landscape tradition of the American West as preserved in the art galleries and museums oof Wyoming. His approach to color and composition was influienced by painters such as Clyde Aspevig, Scott Christensen, Lorenzo Chavez, George Carlson and T. Allen Lawson. Gary has developed a style of pastel painting that can be mistaken for oil but whose luminous surface, upon close examination, is found to vibrate with the subtle interplay of woven strokes of color. Gary brings to the easel his own unique sense of composition and light borne from lifelong outdoor study and an early interest in photography. While Gary took his time coming to fine art as a profession, he has quickly accrued numerous awards including several Best of Show and First Place awards in national exhibitions, the Buffalo Bill Historical Center Award and placement in the Pastel 100. Gary is a Master Signature Member of the Pastel Society of Colorado, recipient of a Master Circle Medallion from the International Association of Pastel Societies, a signature member of Pastel Society of America, Pastel Society of the West Coast and Northwest Pastel Society, and a member of the American Impressionist Society and California Art Club. His paintings are found in collections across the United States and his work has been exhibited at the Butler Institute of American Art, The Haggin Museum, Stockton, California, the National Arts Club in New York City, and The Brinton Museum, Big Horn, Wyoming. Subjects: Landscape – especially snow, water, mountains The artist's hometown of Buffalo, Wyoming, sits at the base of the Bighorn Mountains. Grassy rolling plains rise abruptly to heights of over 13,000 feet in the Cloud Peak Wilderness. The ranches, hay meadows and wandering streams that water them are among Gary's favorite themes. Style: Representational with loose painterly approach. Technique: Gary says: Painting begins with a loose charcoal sketch on my textured board. The sketch is then converted into a charcoal value study. This is an important step in helping me evaluate the composition before applying color. At this stage the drawing can still be removed if the composition needs correction. A workable fixative is used to set the charcoal and keep it from mixing with the colour layers that come next. I spray fixative until I can't rub the charcoal off with my finger but not so much as to fill the tooth of the surface. One thing I like to do is not paint the colour I see directly but let two different colours blend either on the painted surface or in the viewer's eye to create the desired colour. I might use warmer and cooler versions of the color or richer/greyer, etc. to achieve the effect. That gives me livelier colors than if I just use a solid tone from the beginning. Some pastelists use cross-hatching to get a mix of colors. I prefer to work more like an oil painter, using the sides of the pastel sticks to achieve a wider stroke, varying the pressure to achieve varying amounts of coverage. A very light touch when there is still a lot of tooth is like an oil painter's dry brush technique. Light pressure with hard pastel over soft can give a glazed effect. Heavier pressure with a soft pastel can actually build up a little impasto on the surface that I find attractive. Image View: Thumbnails enlarge in a new page and may be saved. Information on title, medium , support and dimension is reliably provided. Table for Four with View is 16x 20 ins. Bio: Any information that I have posted about pastel artist Carrie Raeburn has been gleaned from her website. Carrie Raeburn began seriously to paint in 1997 and to study with with some of the great American pastellists, including Elizabeth Mowry, Herman Margulies, Alan Flattmann, Gil Dellinger, Albert Handell, Christina Debarry, Anita Louise West, Sally Strand, Frank Federico, Anatoly Dverin and Marilyn Simpson. 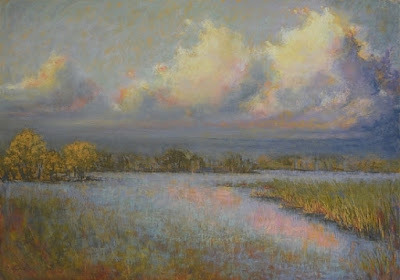 The artist has been juried 5 times into the Pastel Society of America's shows in New York where she won 2 awards, and has been awarded the title of Master Pastellist. She has participated in numerous national and regional shows where she received many awards including Best of Show and First Places. The Pastel Journal selected her work for inclusion in their Pastel 100 in 2002, 2010 and 2011. Carrie is a Past President of the Pastel Society of North Florida, a juried member of the Degas Pastel Society, and of the Salmagundi Club, NY. Navigation: This is a typical FASO website. Gallery: Rain Series ; Force of nature Series ; Nudes ; Cloud Series ; Alchemy Series ; Tree Series ; Carillon Beach Series ; Water Series ; Fruit, Flowers and Vegetables ; Sunset Series. Image View: Thumbnails enlarge in a new page, and the enlarged images may be scrolled. Mouseover the thumbnails for information on title medium : dimension is not always revealed. Images may be saved. Afterglow is 19.5 x 27.5 ins.